Steyer says Dems lack common sense! REALLY? Left-wing billionaire Tom Steyer took aim at members of the Democratic establishment Thursday, saying they “lack common sense” for their hesitation to back a campaign to impeach President Donald Trump. 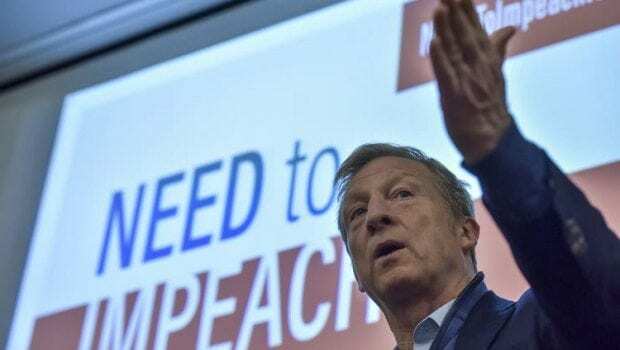 Steyer, rumored to be a candidate for the 2020 presidential election, spoke to a crowd of progressive activists at the Netroots Nation Convention in New Orleans and accused Democrats of not making a “serious effort” to impeach Trump. In what sounded at times like a grassroots campaign speech, Steyer took aim at Trump, calling the president “wildly corrupt,” and lashed out at Democrats for not taking action. Steyer is the founder of the Need To Impeach campaign, which is aimed squarely at President Trump. The billionaire said Thursday that while Democratic lawmakers tell him in private about their willingness to back his campaign, they won’t take any public stance. Steyer reportedly has pledged $40 million to his campaign since it launched last October. Previous articleTrumka under fire from his own! Next articleReligious persecution still alive and Well!